One month ago, ATD and Concern launched their Leave No One Behind Coversations initiative at the Sustainable Ireland conference in Croke Park. A few short weeks later, four stimulating and fruitful workshops have taken place in Dublin and further afield. The inaugural workshop took place with friends at HQ in Mountjoy Square. Elaine, who is a long-term friend of ATD, celebrated her birthday and the group learned how Leave No One Behind is translated into Estonian and Uzbek. 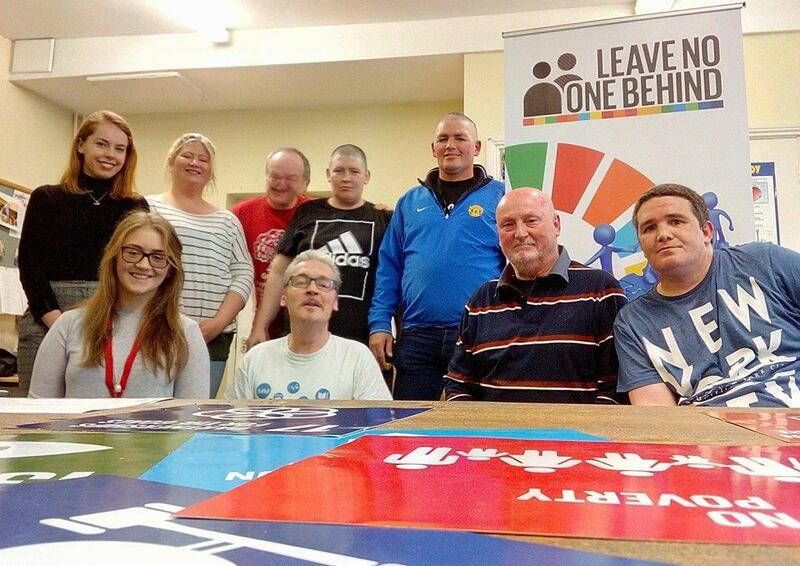 The discussion focused on the idea of Leave No One Behind within Irish society. Many ideas were exchanged and some interesting thoughts emerged. “Leave No One Behind.” People that are living in poverty, or are homeless or really really hungry… All those goals, the 17 goals… people who are gay, lesbians, bisexual, people in low places, people in high places… No matter what they’re going through, what their struggle is, that you offer your services. We’re all equal. Even if its just listening to someone when they’re talking, that’s helping people, that’s what I feel. I was just thinking, 17 goals. There’s people out there and they look at people on the ground and they’re laughing but we all came from the one place, everyone. Our next Conversation took place in the Civic Centre in Ballymun. In this workshop, we discussed the language used in the promise. We also discussed what can happen when efforts to Leave No One Behind drive families apart rather than bringing people together. Is it possible to lose yourself in putting all your efforts into leaving no one behind? Our third conversation took place in the heart of Dublin’s North Inner city with a group of men with experience of poverty and addiction. The many contexts in which the ideals of Leave No One Behind can be applied were discussed. It was agreed that to ensure your ideas are represented, one has to ensure that one votes. It also became clear that everyone wants to participate in society but when it feels like there are so many hurdles in the way, one can feel inclined to give up when overcoming the first seems impossible in itself. Our most recent conversation was held in NUI Maynooth with academics and members from the development sector in Ireland. There was a lively debate on what global priorities should be and on whether Ireland focuses too much on overseas development while turning a blind eye to domestic problems. Four successful Conversations to date and many more to come, we hope. Thank you to all participants!